The Cover: The cover was what initally drew me in-it has a very stereotypical YA cover. A girl in a long dress walking through a forest and her face is concealed. The cover is actually how I knew it was a YA book (I am not sure if that is a good thing or not). The cover of the book actually reflects the storyline and how I felt about the book- it was a "meh" to me. I really wanted to like Jane more. She seemed smart, and street smart, but she immediately went gaga over the first boy she sees- Lucian, even when he wants to drink her blood. Lucian isn't a vampire. At least I don't THINK so. This was one of the main problems I had with this book- I felt like I never actually knew what was going on... are they vampires? Why is she staying with him if she can't stand him? Do any of these people have morals? Is there fae magic? Why does she keep seeing people in the birch trees? What is with all the faerie jokes if there are no fae in the book? I felt like none of my questions were answered by the end of the book, and I was pretty irritated by that. One of the main problems I had with this book was the plot- it was traveling along nicely and then took a turn for the weird and then suddenly a random character shows up and tries to kill Jane and the book is over. When I finished the book I felt very.... disappointed. I wanted to like this book so much more than I did. They only redeeming qualities in this book were a few of the side characters like Violet and Jake. They were characters that I found interesting and that I could connect to. 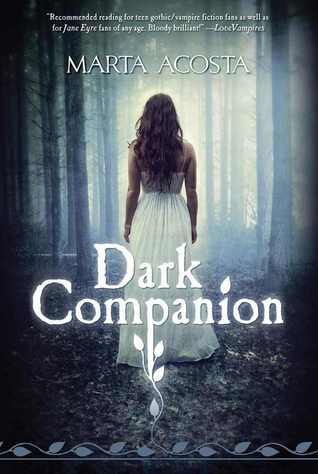 While Dark Companion had an interesting premise, the actual story fell flat. Unless somehow the book gets amazing reviews, I doubt I will be continuing on with this story. I'm reading this one right now (on and off) and I"m really struggling with it. I can't seem to get into it and I'm just not interested >_< I wish I could get more into it, but hopefully it will pick up for me! Great review!